HyperX Cloud Stinger: should I buy this gaming headset? We’ve come a long way in the PC gaming audio space since the days when sound cards and digital surround sound were the name of the game – to the point where you can get quality audio from a relatively affordable PC gaming headset. But, just how low does it go? The HyperX Cloud Stinger, once lauded as one of the best PC gaming headsets on this very site, is an over-ear gaming headset that calls for just $49/£49 for what’s honestly a rather quality set of headphones. That low price will get you an astonishingly high amount of features for both function and comfort. So, will just 50 bucks or quid – a relative pittance in the grand scheme of your Black Friday and Cyber Monday expenses – be enough to upgrade your PC gaming audio to the next level? 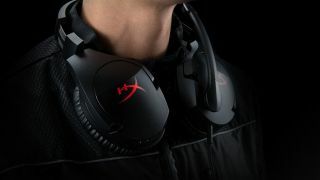 HyperX’s Cloud Stinger is slightly rudimentary in its design, a solid piece of black plastic (with an adjustable steel slider for sizing) connecting two large ear cups with the HyperX logo emblazoned on them. These ear cups can rotate 90 degrees for a better fit that can more easily rest on your shoulders when it’s break time. Inside, you’ll find memory foam cushions beneath leatherette ear cup pads, which wrap around 50mm audio drivers. On the left ear cup rests a microphone on a swivel that, when moved upward, automatically mutes itself – that’s a super convenient feature that not even some high-end headsets include. Finally, gamers that like to play on Mac every once in a while (maybe at work?) will appreciate that this is a multi-platform headset supporting both Windows and macOS. While the HyperX Cloud Stinger goes for just $49/£49, so do a few other competing budget gaming headsets. Most notably, those include the $49/£49 Corsair HS50, which features a more adjustable microphone that’s detachable (though, it doesn’t auto-mute). This one, too, is a multi-platform headset, however it’s more widely so with support for Xbox One, PS4 and Nintendo Switch, too. We’d say that the HyperX Cloud Stinger is certainly the more feature-rich – and PC-friendly – of the two, but not quite as widely applicable to your various gaming devices as Corsair’s. That said, the HyperX also has a super-neat (and useful) auto-muting feature, which is a rarity at this price point. So, if it’s high-end PC gaming audio for a bargain that you’re looking for, keep an eye out for the HyperX Cloud Stinger among all the Black Friday gaming deals.